Of the roofing materials, asphalt shingles are the most common. 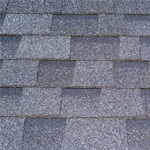 Shingles can be made with recycled, mixed paper bases and some companies use recycled products in the surface aggregate. Selecting light colored shingles will increase the amount of solar heat reflected. Even light asphalt shingles will absorb more heat than other roofing materials because of their standard black bases. Ordinarily shingles typically last from 20 to 30 years. New developments in asphalt shingles has produced laminated shingles, which have a reported life of 25 to 50 years. Slate shingles are a very durable roofing material that can last from 45 to 75 years. Because of their weight—they are 3 times heavier than asphalt slates—your structure must be able to accommodate this additional burden. Slate is an expensive option. Expect the cost for the materials and instillation to be around 4 times more expensive than asphalt shingles. 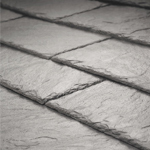 Slate can be easily recycled and is considered an environmentally benign option. Because of the darker color of the slate, the roof will absorb solar heat. 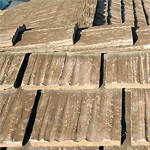 Clay tiles are fired in locations close to clay quarries. Consider finding a local clay quarry to minimize transportation and environmental costs. The durability and life of the tiles depends heavily on the quality of the clay used to produce them. Low-end tiles are more susceptible to changes in temperature, which cause them to crack and break. Clay is a good option for those seeking to collect rainwater. 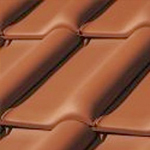 Tiles are also available in light or white colors, reducing the roof’s retention of heat. Like slate, clay tiles are significantly more costly than asphalt shingles. Make sure that your building can support the heavy weight of clay tiles. Considered a cost effective alternative to clay tiles, concrete tiles are also durable and heavier than metal and asphalt options. They tend to retain heat longer than clay, making them less energy efficient. Additionally, concrete tiles are more energy intensive to make. Yet, making them closer to the construction site eliminates the need for transporting them long distances. Fiber-cement composite is durable, fireproof, and have warranties of up to 60 years. 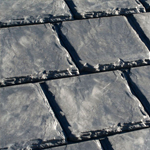 Lighter than concrete tiles, these composite slates were made with recycled materials. Unfortunately light color options are rare. Made from discarded tires, recycled rubber roofing appears to be a durable option for roofing materials. Because this product is new, its long-term value is unclear. It is still uncertain whether the material will impact the purity and taste of water runoff collected from it. 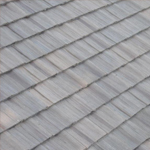 Wood shingles are usually made of cedar, pine, or spruce. Cedar has proven to be the most durable option and can last up to 30 years. Weather and sun exposure will fade the wood from its original brown or reddish color to a gray. Wood is susceptible to shrinking and warping, as well as rotting. The cost of instillation tends to be high. 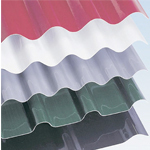 Steel, aluminum, and copper shingles, tiles, and panels are also used for roofing. While a metal option is less expensive than slate or tiles, it tends to be at least 50 percent more expensive than using asphalt shingles. Metal roofs have a lifetime of 30 to 50 years. 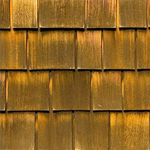 Copper roofs, while significantly more expensive, have lasted up to 100 years. Metal is lightweight, easily recycled, and works well with rainwater catchments. Although durable, hale has been know to dent metal roofs. Metal roofing is also energy intensive to produce. 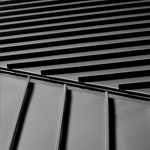 Metal coatings can provide your metal roof with more protection. Zinc (galvanized) coatings can be used to protect steel from rusting. Once the oxidation uses up the zinc (on a low slope roof in a wet climate, this can happen in 5 years), the steel will begin to rust. 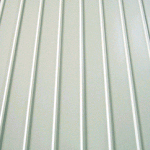 Aluminum coatings work better than zinc and can have warranties of up to 20 years. Aluminum-zinc alloys provide even more superior protection and have warranties of over 20 years. Paint can also be used, although you should only use factory applied paint. Resin finishes are not very durable and are not recommended. Expect your paint to fade within 5 to 7 years. Silicone-modified polyester finishes work very well and generally have 20 year warranties. Fluoropolymer resins are even more superior. Are also extremely durable and can last up to 40 years with little to no maintenance. This option is superior to a polyester resin finish. Because metal expands and contracts with temperature changes, your metal roofing panels and shingles move. These thermal movements can increase the size of the fastener holes, leading to leaks. Using washers on your fastener holes effectively protect them from heat and solar rays, keeping them covered and protected. Movement over purlins will not harm your roof. If your metal roofing is installed directly over the solid deck, use Z-shaped metal sleeps to prevent leaks and roof damage. Darker colored roofs will move more because they absorb more energy and heat. Solid aluminum panels tend to move more than steel ones.